Have you ever wondered what makes guerrilla filmmakers tick? What is the invisible force that drives each and every one of them to sacrifice their normal lives to pursue a position in one of the most competitive arts in the world? Welcome to the outrageous world of independent horror moviemaking. HORROR BUSINESS is a wild, unique and sometimes hilarious document of what happens when five directors with enormous dreams and very little money attempt to make their own horror film. HORROR BUSINESS is a nostalgic trip into the thriving, popcorn induced culture that was born out of late night double features and midnight monster movies. It follows its subjects through their struggles, frustrations and triumphs. HORROR BUSINESS also features interviews with the most prolific independent horror icons alive, including Herschell Gordon Lewis, Sid Haig, Joe Bob Briggs and Lloyd Kaufman. 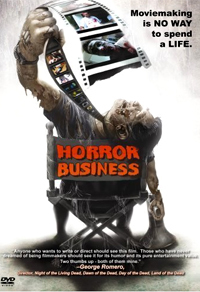 “Horror Business” is an entertaining and engaging look into the world of low-budget horror films and the men (and women) behind them. It expresses an unflinching love for movies such as “The Texas Chainsaw Massacre,” “Dawn of the Dead,” and “The Last House on the Left,” and laments the state of modern day horror movies. An extremely competent, thoroughly engaging film about horror movies and those who love them." FESTIVALS- Winner- Long Island Film Festival "Best Documentary- Audience Choice Award"